Trump-Xi Summit, a Month Later – So What and What's Next? Trump-Xi Summit, a Month Later – So What and What’s Next? Who came out relatively stronger from the summit, what are the ramifications for the U.S.-China relations, what to expect when Trump visits China next, and where are the U.S. strategic opportunities? The heavily choreographed Trump-Xi Summit held on April 6-7 seemed more about atmospherics than substance and did not yield any concrete accomplishments beyond pledges of increased cooperation, new frameworks for dialogue, and a state visit to Beijing by President Trump later in the year. One month later, as the dust settles and more disclosures are made, what can be said now of the summit, and more importantly, so what and what’s next? Part 1 of this two-part series outlined the perceived and actual outcomes from a Chinese, American, and international perspective. 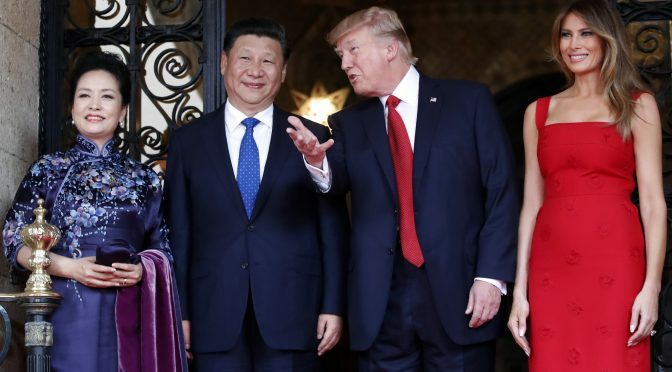 With this as a backdrop, Part 2 now discusses which leader came out relatively stronger, the ramifications for the U.S.-China strategic relations, what to expect when Trump visits China later in the year, and finally where the strategic opportunities lie for the U.S. and how Washington can leverage them. On the whole, Trump came out relatively stronger than Xi in terms of managing expectations and creating and shaping favorable visuals. From the beginning, Xi pressed for an early summit in the hopes that by acting first and boldly, he could seize the strategic initiative and set parameters for the new U.S. president who had yet to fully form his national security team and settle on his China policy. Xi’s advance team pushed hard for exacting protocol demands to make sure that Xi appeared to be a strong and resolute leader who could hold his own against the U.S. president on a global stage, and for China to project an international image of a rising global power that is equal in stature and standing to the United States, a declining global power. All things considered, Xi gained little and Trump gave little away during the summit. Xi sought, but did not get Trump to publicly reaffirm the One-China policy, endorse China’s new model of great power relations, or give concessions in the areas of trade and commerce, North Korea (Terminal High Altitude Area Defense missile system), Taiwan (arms sales), and maritime sovereignty (South China Sea). Xi did, however, lower heightened tensions, dampen the risk of a destabilizing trade war (for now), and secure an agreement for his proposed four dialogue mechanisms covering diplomacy and security, economics, law enforcement and cybersecurity, and social and people-to-people exchanges. Still, Trump largely controlled the setting, atmospherics, and strategic narratives from start to finish due to what can essentially be boiled down to homecourt advantage. As the summit’s host, he arrived later and did not greet Xi when Xi first landed in Florida. The tone-setting slight, among other later maneuvers, incrementally diminished Xi’s stature as a world leader – a perception that Xi wanted to avoid at all costs. Hence, Xi calculatingly made a state visit to Finland, a stop-over en route to visit Trump in an initial attempt to sidestep such a suppliant visual. Then at the end of dinner on Thursday, Trump personally informed Xi that he had ordered missile strikes against Syria before announcing the action to the world moments later. Xi was left flat-footed and awkwardly expressed an appreciation for Trump for letting him know and providing the rationale, and indicated that he understood that such a response was necessary when people are killing children. Remarks had to be clarified later by the Chinese Ministry of Foreign Affairs, reiterating that China “opposes the use of force in international relations and maintains that disputes should be peacefully resolved through political and diplomatic means such as dialogue and consultation.” Xi’s perceived failure to stand up to Trump and defend his country’s interests on a global stage will likely have consequences back home. The charismatic Chinese leader rose to power by looking strong, but Trump, Xi’s political opponents will say, made Xi appear weak and consequently made China look weak. Another possible tell-tale sign that Trump got the upper hand was the subdued summit coverage by the Chinese media relative to their American counterparts. While U.S. media provided extensive coverage of arguably the most important bilateral relationship in the world, Chinese media was surprisingly low-key. Normally when Xi travels overseas there is full press coverage as part of a larger public diplomacy campaign to dominate the strategic narratives. For a trip to the United States to meet his equivalent, greater coverage would certainly have been appropriate and warranted. Only after the conclusion of the summit did the Chinese media start to report more details of the meeting, albeit, with only basic information at first. Yet another anecdotal indicator that Xi underperformed during the summit was the high level of interest among Chinese netizens on Sina Weibo, a popular microblogging platform, and Sina Weibo’s attempts to restrict online discussion on the topic by deactivating the comment function on some relevant posts and removing critical posts that attempted to link the U.S. missile strikes on Syria to the summit. That said, the self-imposed media censorship may have been driven partly by Beijing’s hyper-concerns about Trump’s unpredictability and the high likelihood of an embarrassing atmosphere. Still, subsequent media reports, official public releases, and think tank commentaries in the weeks that followed appeared largely cautious and defensive, and in many cases, in full spin control. They expended an inordinate amount of attention on the intangible personal relationship between Xi and Trump, on the former’s proposed four dialogue mechanisms, and resumed their public diplomacy campaign to underscore the two countries’ economic interdependence, imperative of avoiding a destabilizing trade war, and the importance of preserving the China-U.S. strategic relations. The Trump-Xi Summit injected much-needed certainty and stability back into the strategic relationship. From Beijing’s perspective, Trump unhelpfully introduced unpredictability and friction to bilateral relations on trade deficits, the RMB exchange rate, North Korea’s nuclear and missile development, Taiwan, and the South China Sea (SCS). So, despite not yielding any concrete accomplishments beyond pledges of increased cooperation, new frameworks for dialogue, and a state visit to Beijing by Trump later in the year; the summit did indirectly bring some stability (albeit temporarily) into the strategic relationship in terms of dampening the risk of a disruptive trade war (for now), setting aside the contentious issue of Chinese currency manipulation (for now), tacitly reaffirming the One-China policy, and repeating the importance of adherence to international norms in the East and South China Seas and to previous statements on non-militarization. It’s been over two months since Trump took office, but leading up to the summit some pundits were still arguing that the U.S.-China relationship remained in transition. This is no longer the case. The summit signaled the reset of bilateral relations from a collaborative nature (Obama’s approach) to a more competitive one (Trump’s approach) as codified by the guiding principle of “America First.” Washington will now pursue foreign policies that unequivocally put U.S. national interests first, as evidenced by Trump’s inclination to change the status quo and possibly use Taipei as a bargaining chip in trade negotiations with Beijing (and possibly North Korea too), focus on the growing U.S.-China trade imbalance and Chinese currency manipulation that puts the U.S. economy at a competitive disadvantage, flexibility to re-prioritize the aforesaid economic interests below the more pressing North Korean nuclear and missile threat, and willingness to use military force to uphold international rule of law or when faced with threats abroad. The Trump-Xi Summit gave the United States “relative, tenuous, and transitory” strategic advantage over China in terms of initiative and narrative. Trump appears to have successfully co-opted Xi as a strategic partner in stabilizing the situation on the Korean Peninsula, in exchange for concessions in the areas of trade imbalance, currency manipulation, and Taiwan. If so, the partnership is strictly transactional. A North Korean buffer state will remain a core Chinese national interest, and Beijing will undoubtedly take steps in the near future to regain the initiative that it enjoyed for most of the past eight years. It will do so more cautiously and subtly this time around, perhaps at the Belt and Road Forum in Beijing (14-15 May), Shangri-La Dialogue in Singapore (2-4 June), and the Asia-Pacific Economic Cooperation and East Asia Summits in Vietnam and the Philippines respectively (November). Xi may be under intense political and personal pressure to do much better at the next state visit to Beijing by Trump, especially if the meeting precedes the 19th National Congress of the Communist Party of China (CPC) in late 2017. There is widespread speculation that he is trying to build political momentum to ensure that more members of his faction are promoted to the Central Committee and the Politburo, a necessary interim step if he wants to change CPC’s rules to serve an unprecedented third term as president (and/or retain his other two titles of general secretary of the CPC and chairman of the Central Military Commission) and maintain power and influence beyond 2022. If so, Washington can expect intense shaping and robust deal-making from Beijing in the coming months. Xi will do his utmost to reset the conditions in China’s favor to not only regain the strategic advantage (initiative) prior to the second summit but also to look personally strong and in control during the summit for his domestic audiences (Chinese people and fellow CPC members). He will certainly leverage his homecourt advantage to control the setting, atmosphere, and narratives much like Trump did. Hence, could this back-and-forth jockeying for relative strategic advantage be the start of a new Cold War between the United States and China? Or can Trump and Xi reach a strategic accommodation that manages strategic competition and avoids the Thucydides Trap? Leverage the Strategic Advantage. Both Washington and Beijing share the same strategic goals for the Korean Peninsula – strategic stability and denuclearization. Continue co-opting Beijing to exert pressure on Pyongyang to renounce its nuclear ambitions and return to the negotiating table. To be successful, Trump must be willing to give and take with Xi across the spectrum of strategic interests, while making sure Xi clearly understand the risks and implications of not playing an active role in moderating Kim Jong-un and stabilizing the Peninsula. This will allow the two presidents to build trust, which could, in turn, open opportunities in other areas of disagreement (trade, currency manipulation, Taiwan, SCS, etc.). Protect the Global Commons. In pursuing the aforesaid strategic opportunities, one area where Washington must be careful not to concede too much is in the contested and interlinked global commons of maritime, space, and cyberspace. Giving unwarranted ground in these strategic domains will undermine American preeminence and encourage China to press for additional concessions in return for vague and passing promises of restraint, while quietly and steadily expanding and strengthening its position in the global commons. Play the long game. Maintain the Strategic High Ground. Do not let Xi unilaterally set the conditions and impose his will when he meets Trump again in Beijing later in the year. Xi will have the homecourt advantage and will be pressured to put on a strong showing, so negotiate for everything to level the playing field and mitigate expected protocol payback from Xi for Mar-a-Lago. Or else, the United States will prematurely return the strategic initiative to China. Remain firm. China respects strength. From Beijing’s perspective, the Xi-Trump Summit at Mar-a-Lago achieved a great deal. It not only “charted a course and provided a roadmap for China-U.S. relations, but also established a new cooperation mechanism that will enhance and protect the all-important strategic bilateral relationship.” So how much of this narrative is congruent with Washington’s views of the summit? And more importantly, if the summit was as significant as Beijing claimed, then what and how much did it impact the U.S.-China relations? It may be too soon to fully answer this critical question. The latter half of the play has yet to unfold. Until then, it behooves Washington not to give too much ground in one area in exchange for gains in another without careful thought and consideration of any enduring implications. Otherwise, the United States risks inadvertently ceding its strategic position in the Indo-Asia-Pacific, undermining its roles and responsibilities as the global leader, and paving the way for China to become a regional hegemon.